(Reuters) – President Barack Obama vowed on Tuesday to act quickly once he receives a State Department recommendation on whether to remove Cuba from the U.S. list of terrorism-sponsoring countries, a remaining obstacle to the restoration of relations between Washington and Havana. With just days to go before a hemispheric summit in Panama where Obama will come face-to-face with Cuban President Raul Castro, he offered no clear sign of how he was leaning or the timeframe for his decision. He ordered the review immediately after announcing a diplomatic breakthrough with Havana on Dec. 17. Obama, in a Reuters interview in early March, said he hoped the United States would be able to open an embassy in Cuba by the time of the April 10-11 Summit of the Americas, and U.S. officials have since said the review was being expedited. But the lack of a decision so far on taking Cuba off the terrorism blacklist – something Havana has steadfastly demanded – has raised strong doubts about whether the review will be finished in time to make further strides toward normalization before the summit. 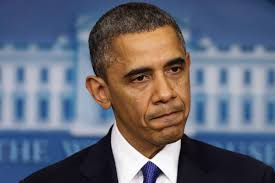 “As soon as I get a recommendation, I’ll be in a position to act on it,” Obama said in an interview with National Public Radio. Obama gave no sense of where the administration is heading on the issue but made clear that his decision would be based not on “whether they engage in repressive or authoritarian activities in their own country” but on the “current activities of the Cuban government” with regard to terrorism. Cuba was added to the list of terrorism sponsors in 1982, when it was aiding Marxist insurgencies. But it is currently aiding a peace process with Colombia’s left-wing FARC guerrillas. Colombian President Juan Manuel Santos has asked the United States to repatriate “Simon Trinidad,” a FARC leader who is serving 60 years in a US prison, an adviser to ongoing peace talks with the guerrilla group said Monday. According to former Israeli Foreign Minister Shlomo Ben-Ami, the Santos administration asked US Vice-President Joe Biden to see what possibilities exist to repatriate the rebel leader. Trinidad was convicted in 2007 of conspiring to kidnap three US military contractors, who were held by the FARC between 2003 and 2008. 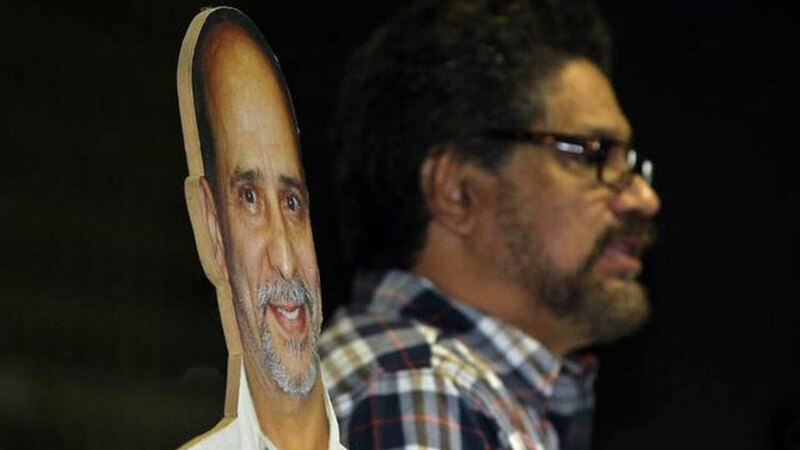 Since then, rebel spokespersons are frequently flanked by a life-size cardboard cutout photo of Trinidad. Santos’ alleged request to repatriate of the FARC leader appears to be part of a larger effort that also seeks the removal of FARC guerrillas from the United States’ list of extradition requests. The Colombian president discussed the ongoing peace talks over the weekend with Bernard Aronson. The senior US diplomat was appointed Special Envoy for the Colombian Peace Process by US Secretary of State John Kerry less than two weeks ago and has already met with the government and rebel delegations. The leaked secret meetings have not been confirmed or denied by either the US government or the FARC, deemed a terrorist organization by the US and the European Union. The FARC have been fighting the Colombian state since 1964. The United States has long played an active part in the conflict and spent billions of dollars in the first decade of this century to support the Colombian state’s military offensive that pushed the rebels to the periphery of the country. Since the peace talks began, the warring parties have agreed to a rural reform, political participation for the rebels, and the FARC’s abandoning of drug trafficking. If the negotiators can come to consensus on transitional justice, victim reparation and a truce, the 50-year-old conflict will come to a formal end. El servicio de inteligencia cubano, que desde hace décadas se ha mantenido muy activo a lo largo de América Latina, ha estado fortaleciendo sus operaciones en Colombia en los últimos años, lo que refleja un mayor interés en el país sudamericano y en los prospectos de una incorporación a la vida política de las organizaciones guerrilleras. Ex agentes de Inteligencia cubanos que conversaron con el Nuevo Herald dijeron que el “Centro de Inteligencia” que La Habana mantiene en Colombia ha estado creciendo en los últimos tiempos, y que sus operaciones están siendo encabezadas por un veterano coronel que está en vía de cumplir 40 años en el servicio. “El Centro en Colombia se ha convertido en los últimos años, después de la salida de la presidencia del presidente Uribe, en uno de los más importantes que tiene Cuba en América Latina”, dijo el ex oficial del servicio de inteligencia cubano Enrique García. “Para Cuba, la consolidación de todo esto que ha hecho [Juan Manuel] Santos, de manera conciente o inconciente, es muy importante”, agregó García, quien estuvo once años en el servicio de Inteligencia de Cuba antes de desertar a finales de los años ochenta. García se refería al Proceso de Paz emprendido con las Fuerzas Armadas Revolucionarias de Colombia por la presidente Santos, iniciativa que está siendo llevado a cabo a través de negociaciones en La Habana. García, quien acaba de terminar el libro Servicios de Inteligencia Cubanos: Testimonio Inédito, dijo que el régimen de los hermanos Castro está muy interesado en que ese proceso tenga éxito, pero no por razones humanitarias. “Piensan hacer lo mismo en Colombia que lo que hicieron en Venezuela […] Los planes son las de llevar a las FARC a la presidencia, haciendo uso del dinero del narcotráfico, para luego pasar a hacer lo mismo que han hecho en otros países”, dijo. “Hacer lo mismo”, se refiere a los proceso de consolidación de poder emprendidos en países como Venezuela y Ecuador, donde las instalaciones democráticas fueron desmanteladas para montar regimenes autocráticos. “El plan es lograr a través de los Acuerdos de Paz, la impunidad que permita que todos los terroristas de las FARC, puedan reinsertarse sin pagar nada por los crímenes que hicieron a la vida política del país, para que después puedan convertirse en senadores, congresistas y alcaldes y aspirar a la presidencia del país”, inisitió García. Las operaciones de inteligencia cubanas en Colombia buscan brindar soporte a ese proceso, y están siendo encabezadas por el coronel de Inteligencia Juan Roberto Loforte Osorio, alías “Ramón”, quien está acreditado ante las autoridades colombianas como Ministro Consejero. García dijo que él conoce a Ramón muy bien. The report noted that Cuba “has long provided safe haven” to members of the Basque Fatherland and Liberty (ETA) separatist group in Spain, as well as the Revolutionary Armed Forces of Colombia (FARC). Both are still considered terrorist groups by the United States and European Union but have participated in peace talks in recent years. Cuba also continues to “harbor fugitives wanted in the United States,” the report added. “The Foreign Ministry energetically rejects the manipulation of a matter as sensitive as international terrorism by turning it into an instrument of policy against Cuba and it demands that our country be definitively excluded from this spurious, unilateral and arbitrary list,” the government said in a statement. The State Department responded that it had “no current plans” to remove Cuba from the list. Critics say the current repression of protesters by Venezuela’s government is reminiscent of the “Cuban model.” Trained and well-armed civilian groups known as “Bolivarian Circles” or “colectivos”—akin to the Castros’ “committees to defend the revolution”—are accused of killing several protesters in the last three months. About 40 people total have died in the demonstrations against Venezuelan President Nicolas Maduro. BOGOTA, Colombia (AP) — Colombia’s FARC rebels on Sunday freed an American they were holding since June, the governments of Cuba and Norway said. The statement by the Cuban and Norwegian embassies in Bogota said that rebels have turned over 26-year-old Kevin Scott Sutay to a commission made up of representatives from their countries and the International Committee of the Red Cross in the nation’s south. Sutay was later delivered to U.S. government representatives at the airport in the Colombian capital. U.S. Secretary of State John Kerry welcomed Sutay’s release, and said the United States was “profoundly grateful” to the Colombian government for its efforts to secure his freedom. Kerry also individually thanked Colombian President Juan Manuel Santos, the International Committee of the Red Cross, and the governments of Norway and Cuba, as well as the Rev. Jesse Jackson, for pushing for Sutay’s release. Editor’s Note: Former CIA officer Brian Latell has stated that Cuban Intelligence has strongly supported the FARC since the 1960s, but the “availability of massive amounts of Venezuelan money” during Hugo Chavez’s presidency triggered considerable growth in the depth and bredth of Havana’s support. His assessment is echoed by Lieutenant General Ion Mihai Pacepa — the highest ranking intelligence officer to ever defect from Communist-controlled Romania – who claimed that by the mid-1970s, both the Cuban and Romanian foreign intelligence services worked jointly with the FARC. 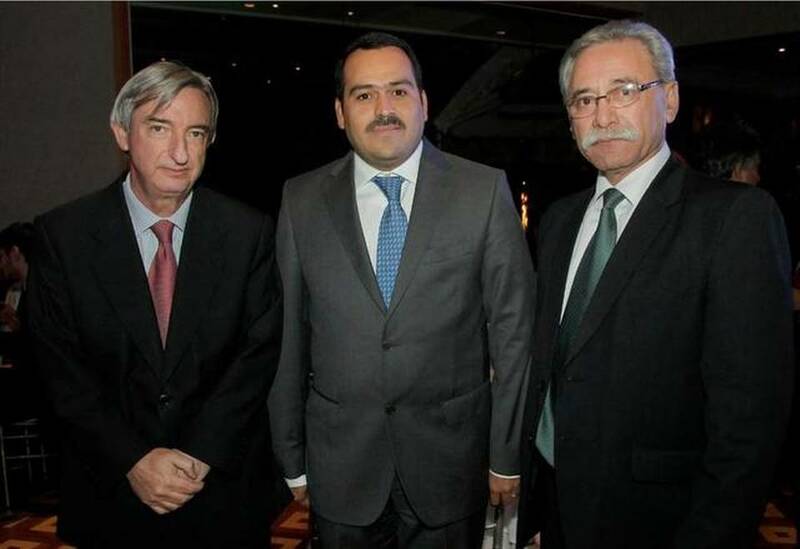 In the context of heightened tensions between Venezuela and neighboring Colombia, provoked by a meeting between Colombian President Juan Manuel Santos and opposition leader Henrique Capriles, Caracas daily CiudadCCS interviewed Venezuelan Minister of Foreign Affairs Elias Jaua. Is Colombian President Juan Manuel Santos our “best friend” (as President Chavez once afﬁrmed) or our worst enemy? Elias Jaua: We are the best friends of the Colombian people and of peace in Colombia. Starting in August of 2010, with the Meeting of Santa Marta, we began building a relationship of mutual respect and cooperation with President Santos. This relationship, however, was derailed last week when Santos chose to receive an opposition leader who fails to recognize Venezuela’s judicial, electoral, and executive powers, the same leader responsible for the post-election violence of April 15th that resulted in the death of 11 Venezuelans, citizens killed for defending the Bolivarian Revolution. That is the point here. Anyone who doubts our position is invited to remember that in September 2012 President Santos met with then-candidate Henrique Capriles. At that time, we issued no formal complaint. At that time, Capriles was just another political actor within the conﬁnes of the democratic process. That is no longer the case. That’s what makes this a grave situation – the Colombian state has received someone who openly deﬁes the Venezuelan state, who fails to recognize the rules of our democracy. The opposition claims that our Revolutionary Government in Caracas has for years received opposition leaders of other nations. What makes this any different? Elias Jaua: None of the people we’ve met with carry out their political struggle on the margins of legality, nor do they openly defy the institutions of the countries they represent. This recent incident demonstrated that there are still many unresolved issues between Venezuela and Colombia. Isn’t it better to place all things on the table? Elias Jaua: As President Maduro put it, paraphrasing President Chavez, Venezuela and Colombia are Siamese twins. We are the children of the same liberator, of Simon Bolivar, but we maintain two distinct frameworks for our development, two different visions of how society should be organized, and this will always be a source of some tension. But the basis of good relations is respect for the internal development of each country and the model each people chooses to implement. We can expect to understand one another, however, only if each of us stays out of the others’ internal affairs. Some analysts believe Santos’ recent attitude is related to the visit of US Vice President Joe Biden to Bogota. Do you think that’s the case? Elias Jaua: I don’t want to speculate on that issue. Only President Santos knows the reasons why he received the governor of Miranda (Capriles). Here’s another question, in multiple-choice format. The Alliance of the Paciﬁc is an organization that is: a) anti-Celac; b) anti-Unasur; c) antiALBA; d) anti-Mercosur; e) all of the above? Elias Jaua: All countries have the right to organize themselves, to associate with one another based on their own national interests and perspectives. We have no objection to the Alliance of the Paciﬁc. We have said, however, not in reference speciﬁcally to that agreement, but in general, that US Imperialism and the Latin American right-wing feel that with the physical departure of President Hugo Chavez the time has come to restore free trade, neo-liberalism, and all that they bring with them. We, in contrast, are sure that they’re mistaken. We believe that the people of Latin America and the Caribbean still hold fresh in their memories the dark neo-liberal decades that brought instability, social exclusion, misery, and the privatization of fundamental human rights such as health and education. For us, that model is unviable in the Latin America and Caribbean of today. Venezuela is the only country that voted against a recent resolution of the UN Human Rights Commission condemning the Syrian government. Why don’t allied nations, including powerful neighbors, take a similar stance?